The Peters Cartridge Company was founded in January of 1887 by brothers Gershom Moore Peters and O. E Peters, and others, for the purpose of loading and selling shotgun shells. At the time, Gershom Peters was the president of King's Great Western Powder Company, the parent company to Peters Cartridge Company, having assumed that office in 1885 upon the death of the powder company's founder and president (and Gershom Peters' father-in-law) Joseph Warren King. 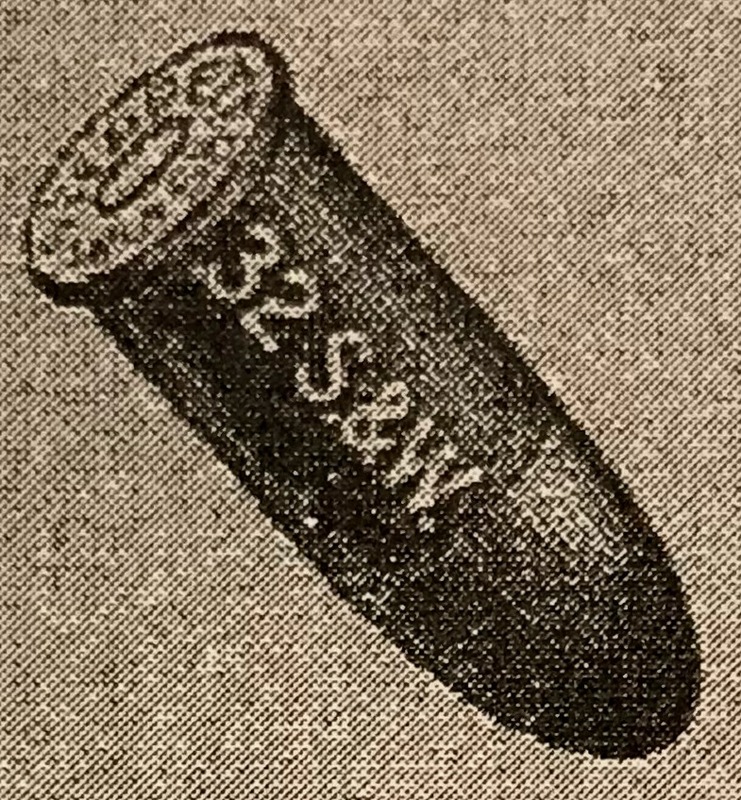 Using Kings powder, empty shells and wads produced by Winchester, the Union Metallic Cartridge Company, and the United States Cartridge Company, and lead shot from the United Lead Company or another supplier, the Peters Cartridge Company commenced the loading of shotgun shells, and was able to issue a price list of their loaded shells sometime in 1888. One cost-saving advantage Peters had over other enterprises that were loading shotgun shells at the time was that their loading equipment, which was designed and patented by G. M. Peters himself, was power operated rather than being hand operated. As a result, Peters required much less labor than the hand operated loaders, resulting in significantly less cost. 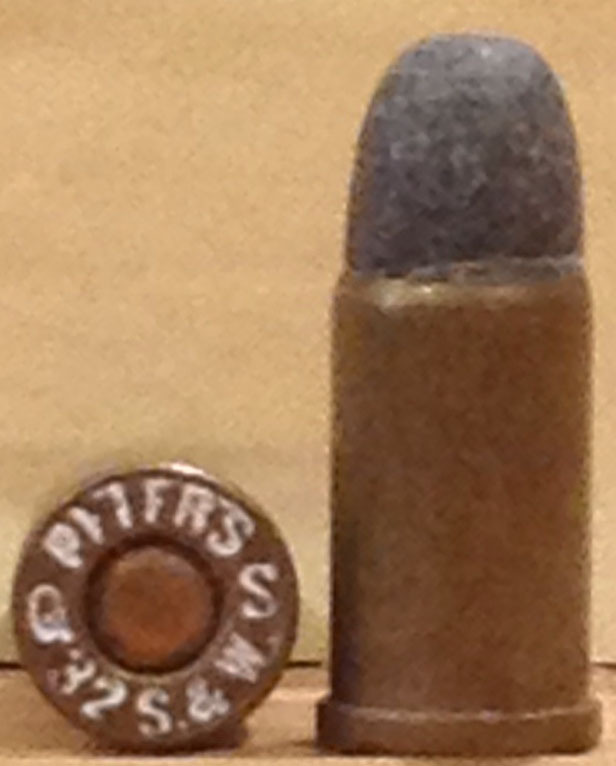 Over the following years, Peters was able to gradually bring the production of all of the components they required for producing loaded shotgun shells inhouse, enabling them to be even more competitive with the larger ammunition makers, and limiting the impact that outside suppliers of components could have on their production and, consequently, on their bottom line. 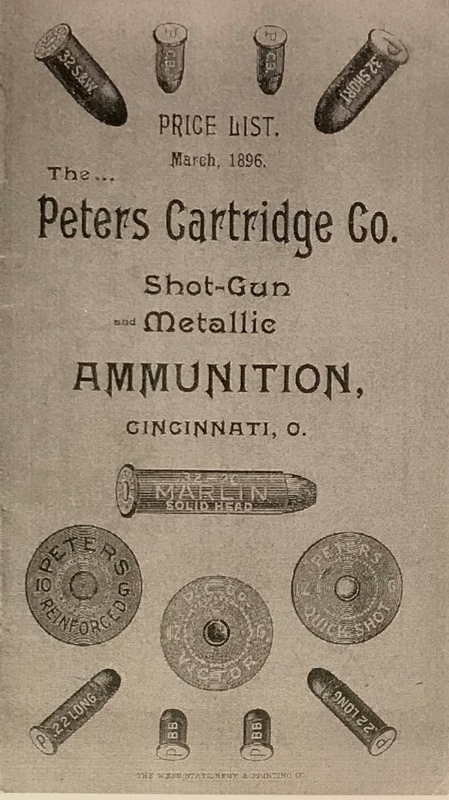 In 1895, the Peters Cartridge Company began producing rimfire and centerfire metallic ammunition for rifles and handguns, loaded with black powder as well as smokeless powder, which the King Powder Company had just developed earlier that year. 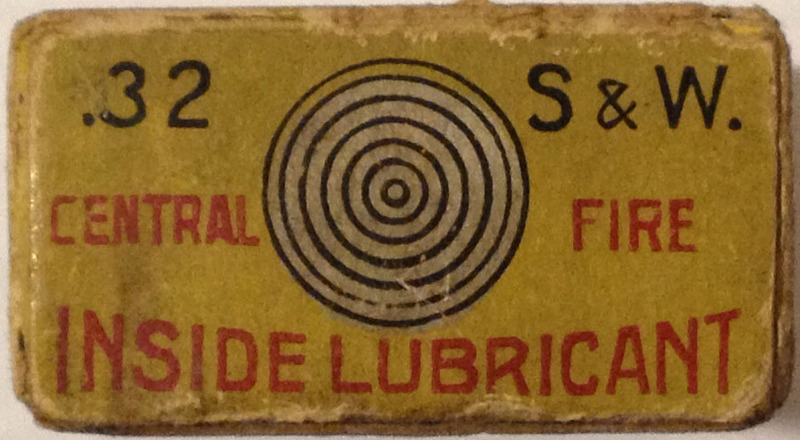 I believe the March 1896 Peters price list was their first that included both shotgun shells and metallic cartridges. 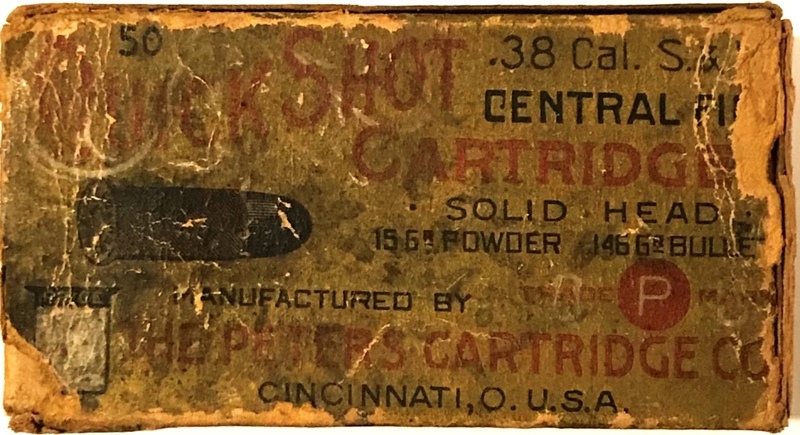 The black powder that was initially loaded in these metallic cartridges was King Powder Company's Quick Shot brand, a formulation of black powder that, according to the King Powder Company was a 'High Grade Black Powder'. It was introduced sometime in 1886; a copyright on the name Quick Shot for gunpowder was issued May 11, 1886. 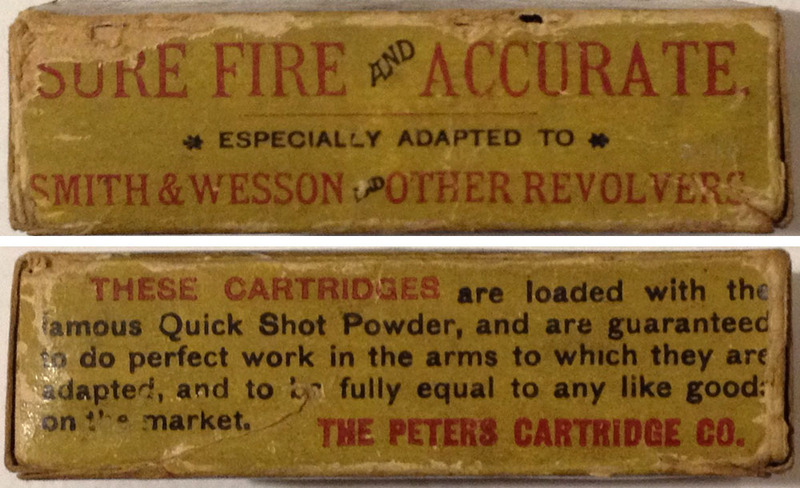 The March 1896 price list refers to their black powder rimfire and centerfire rifle and handgun cartridges as 'Peters Quick Shot Metallic Cartridges'. The price list also includes two pages of loaded black powder shotgun shells which are referred to as 'Peters Quick-Shot Loaded Shells'. The metallic cartridges that were included in the March listing of Quick-Shot loads were the following: (rimfire) .22 short, .22 long, .22 long rifle, .22 blank, .32 short, .32 long, .32 blank, (centerfire) .25-20 Marlin, .32 short and long Colt, .32 Smith & Wesson, .32 Smith & Wesson blank, .32-20 Marlin, .32 Colt's lightning magazine rifle, .32-20 Winchester, .38 Smith & Wesson, .38 Smith & Wesson blank, .38-40 Marlin, .38 Colt's lightning magazine rifle, .38-40 Winchester, .44-40 Marlin, .44 Colt's lightning magazine rifle, and .44-40 Winchester. 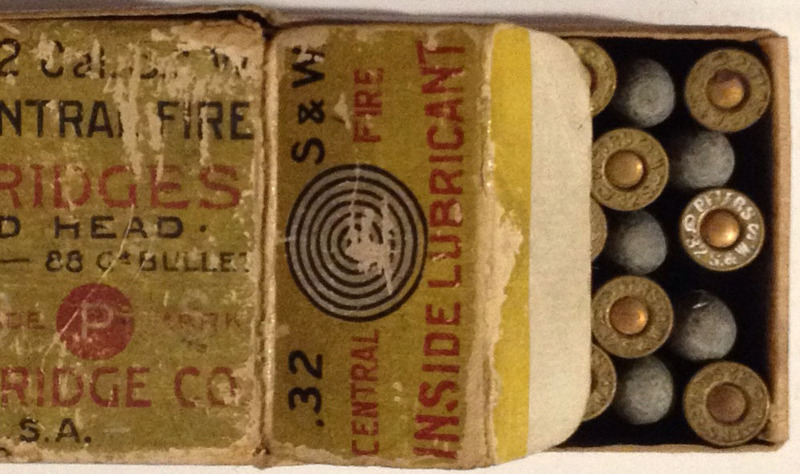 While the rimfire cartridges had no apparent exterior characteristics that would indicate that they were loaded with Quick-Shot powder, some of the centerfire cartridges did. 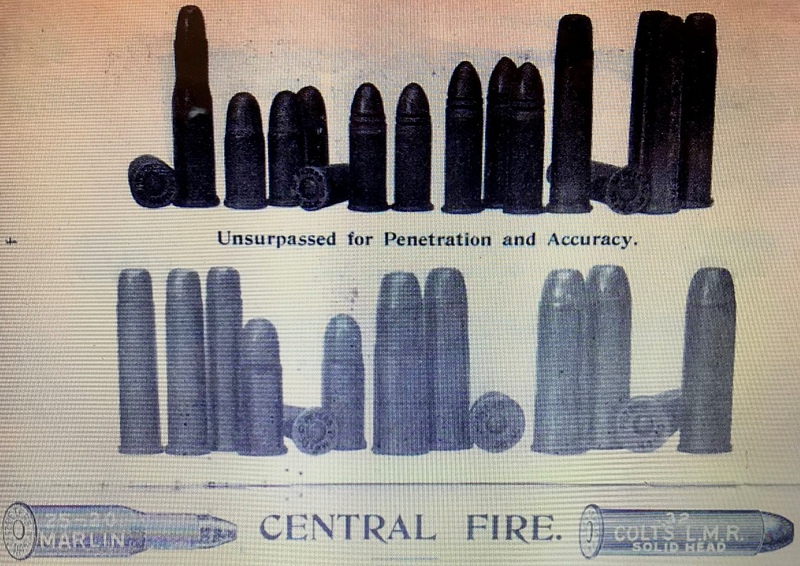 Included above the page with the center fire black powder metallic cartridge price list is the illustration shown above of an assortment of cartridges. Although the illustrations are of poor quality, it can be seen that at least three of these cartridges include the Q and S characters at the 9 o'clock and 3 o'clock positions, respectively, in their headstamps. T he Q and S, of course, were intended to identify the cartridges as Quick-Shot loads. The three cartridges that are so marked are the .32 S&W, the .38 S&W, and the .32 Colt's L.M.R. 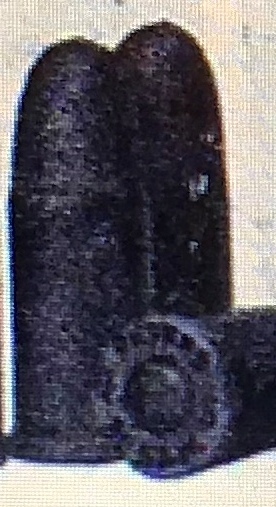 (Lightning Magazine Rifle). 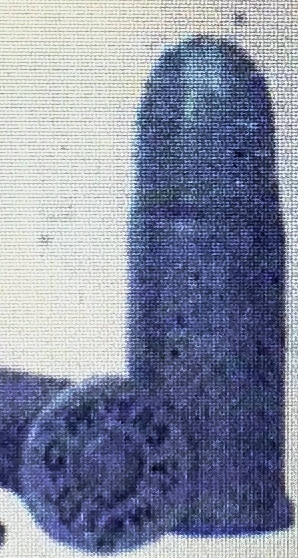 Enlargements of these three cartridges are shown above. 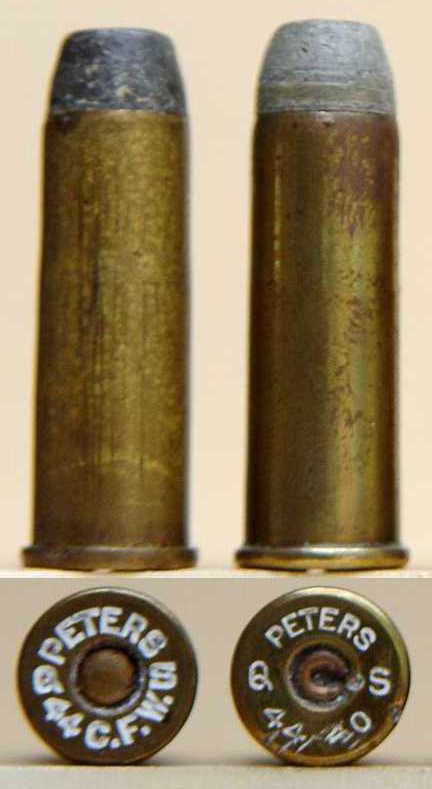 Two cartridges illustrated on the cover of the price list also have the Q S in their headstamps, these being the the .32 S&W and the .32-20 Marlin, both shown here. 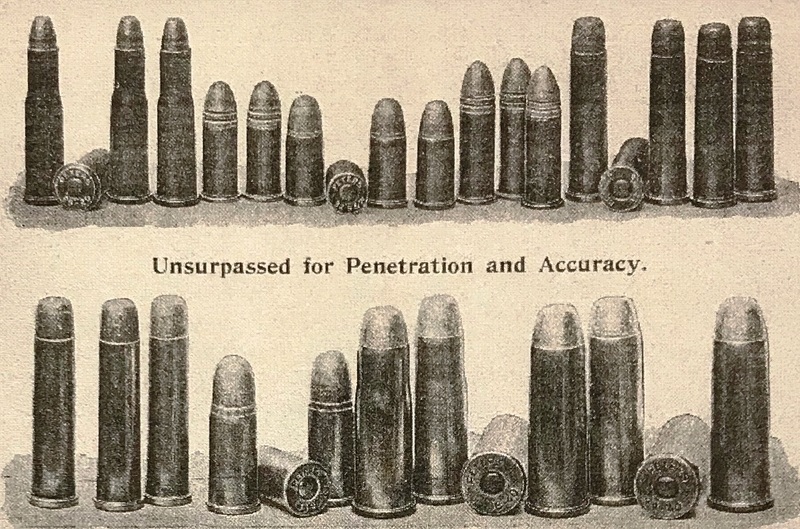 centerfire cartridges from the illustration in the April price list shown above have the QS visible in their headstamps. 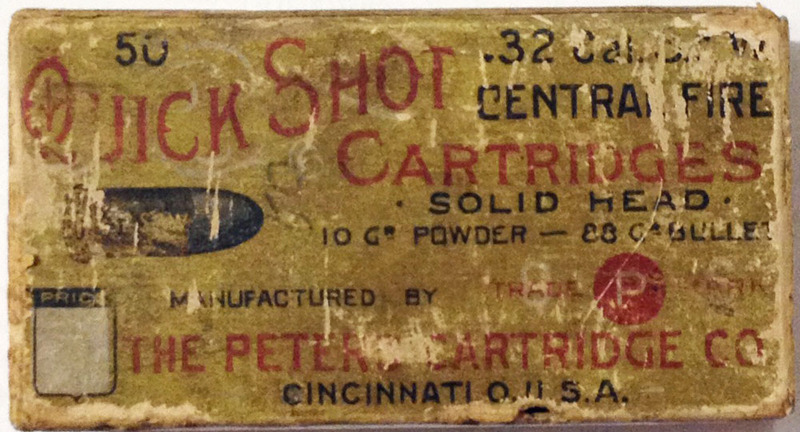 Moreover, the reference to 'Peters Quick Shot Metallic Cartridges' had been removed, as had the reference to Peters Quick-Shot Loaded Shells on the pages of loaded black powder shotgun shells. Instead, the black powder was referred to in both instances as 'Extra Quality Black Powder'. It is unknown if this was King's Quick Shot powder that was being referred to or some other brand of black powder. 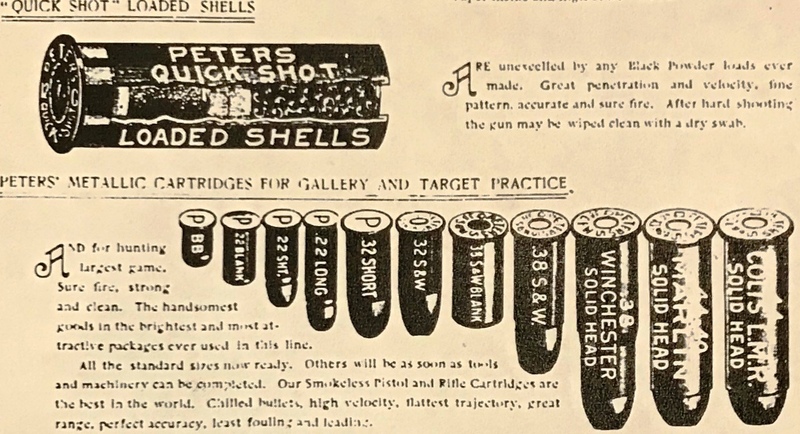 The only reference that was made to Quick-Shot in both of these price lists, and those issued for several years afterward, was to the Quick-Shot brand of 10, 12 and 16 gauge empty waterproofed paper shotshells that Peters sold to sportsmen who chose to do their own loading. What would account for this rather abrupt abandonment of the Quick-Shot powder brand name from one month to the next? It may be an indication that some event occurred that resulted in Quick Shot powder becoming a marketing liability, possibly a powder manufacturing facility explosion, or some other accident. This may explain the rarity of the Q S headstamped cartridges today; perhaps their production was limited to the last few months of 1895 thru early April of 1896. It would be a relatively easy and quick fix to grind the two letters off of the headstamp bunters so as to minimize the tooling costs associated with the change, but why might this have been necessary? black powder metallic cartridges. While the headstamp on the .32 S&W is not legible, the remaining centerfire cartridges (.38 S&W blank, .38 S&W, .38 CFW (Central Fire Winchester, aka .38-40 Winchester), .44-40 Marlin, and .44 Colt's L.M.R.) are all illustrated with the QS headstamps. These illustrations and those from the March 1896 price list don't necessarily represent actual headstamps that were put into production, but they do suggest the possibility that these headstamps did exist. Frank Wheeler, writing in the March 1957 issue of The Cartridge Trader made an appeal for some help putting a list of Peters QS headsamps together; whether or not he made any progress I don't know. 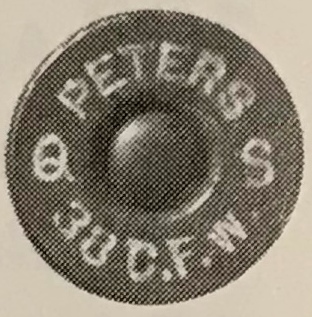 A checklist of Peters headstamps was published in the May-June issue (#316) of the IAA Journal which included five different QS headstamps: .32 S&W, .38 S&W, .38 CFW, .44 CFW, and .44-40 (Marlin). This Peters headstamp list was also included in a 2014 International Ammunition Association Cartridge Forum discussion regarding Quick Shot headstamped metallic cartridges. Of the QS headstamped cartridges included on the Peters checklist, I have only the .32 S&W, the .44 CFW, and the .44-40 (Marlin), and have included photos of these below. I looked through a pile of collector cartridge auction catalogs (Robert Buttweiler, Pete de Coux and Jim Tillinghast) and found only a couple of these QS headstamped cartridge, these being the .32 S&W, and the .38 CFW shown here. One that isn't on the checklist is this .32-20 Marlin owned by Dan Schmidt, who provided me with the photo. It was first brought to the attention of other collectors in a 2014 IAA Cartridge Forum discussion on these Quick Shot cartridges. Unless someone advises me otherwise, I suspect it is the only one known. I have this partially full Quick Shot box of .32 S&W cartridges that have the QS headstamp. Aside from the fact that these boxes are quite rare, they are also unusual because they are the style of box made with end flaps. 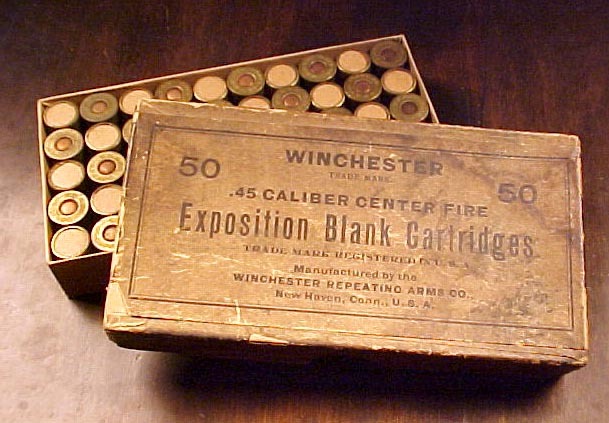 This box style was adopted quite early by Peters for their Quick Shot Cartridges, as the two-piece lift top style box was pretty much the standard with ammunition manufactures until the early to mid-1920s. I also have this rather tired .38 S&W Quick Shot box. Unfortunately, it was empty when I found it, so I'm still looking for my QS .38 S&W. If anyone has examples of other QS headstamped cartridges or centerfire Quick Shot boxes not shown here, I'd appreciate it if you would email pictures of them to me. I'm really hoping to see one of those for the Colt's Lightning Magazine Rifle (.32, .38 or .44). Pete de Coux mentioned in the IAA Cartridge Forum discussion having seen a .44 CLMR box before, but not the cartridge. I have extras of the QS .32 S&W cartridges to trade towards variations that I don't have, or I will trade for other items from my cartridge lists; failing both of those options, I will even pay cash for them. Peters advertisement obtained from an unknown source purported to have come from the initial volume (1895-1896?) of Field & Stream magazine.